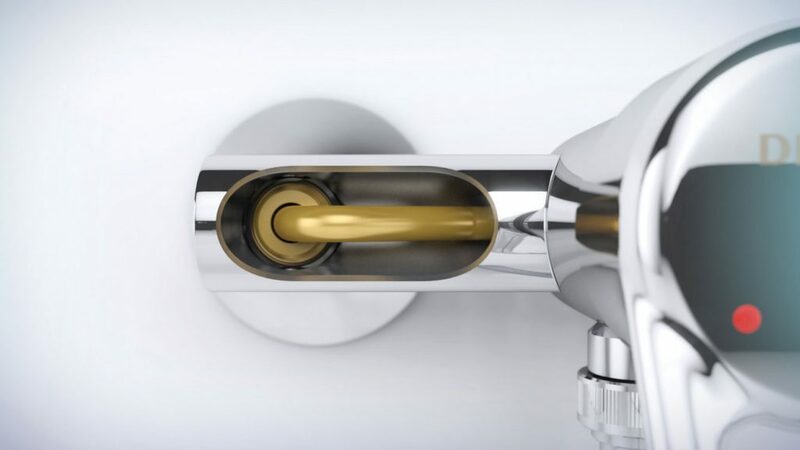 Specifying hot water systems in healthcare environments needs to navigate the tricky balance of providing enough heat to destroy Legionella bacteria, while mitigating the risk of scalding, says Carol Armstrong of Delabie UK. Until recently, thermostatic mixing valves were installed as a matter of course in healthcare facilities to prevent scalding incidents. As a result, there has been marked inter- est in specifying other technologies to deliver safe, temperature-controlled water. The risk of scalding depends on the use and the user. A low-level of risk could be a habitual user who is familiar with the outlet and the type of mixer, for example, healthcare workers using a particular basin for regular hand washing. An intermediate risk level could be hospital visitors who use the public facilities when visiting patients. Although unfamiliar with the facilities, they have no sensory or mobility issues and are able to use the washbasins safely, especially if there are visual warnings about hot water. Where there is high frequency usage by visi- tors, pressure-balancing mixers can provide an intermediate anti-scalding solution (see panel overleaf for details). The ceramic cartridge is sensitive to changes in pressure. An internal shuttle continually adjusts to the incoming hot and cold water supply pressures to ensure a constant temperature at the outlet. If the pressure suddenly drops at the cold inlet, the shuttle reacts immediately and the hot water flow is reduced to a trickle. Likewise, if the hot water pressure drops, cold water is reduced to a trickle. The pressure-balancing cartridge also features a maximum temperature limiter so the visitor is protected from temperature spikes due to pressure drops or pressure differences in the system. To fail-safe, the hot water must shut off if the cold water fails and vice versa. 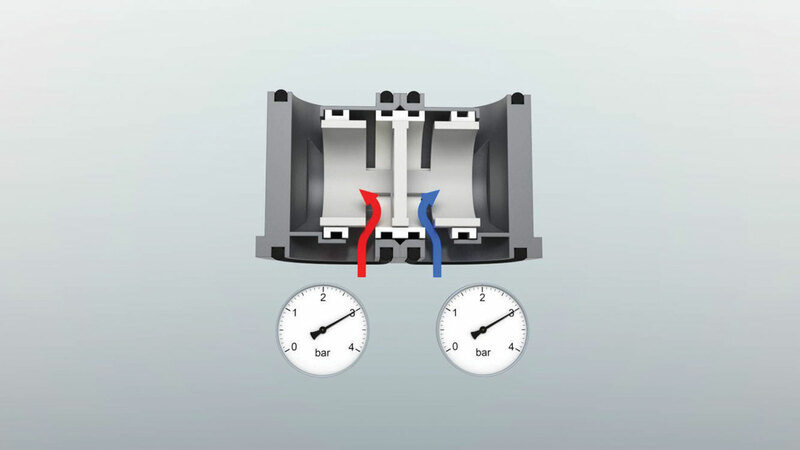 This is where pressure-balancing cartridges and thermostatic cells differ. The latter is able to provide a complete failsafe to TMV3 standards. The most serious scalding risk is where the user is fully immersed in either a shower or a bath, predominantly in non-critical patients’ accommodation and residents’ accommodation in care homes. Where the scalding risk is significant – for example the very young or elderly, those with sensory loss, the infirm or significantly mentally or physically disabled people – the guidelines recommend the use of TMVs for sinks or hand washbasins. A key factor in the development of Legionella bacteria is standing water between 20°C and 46°C. 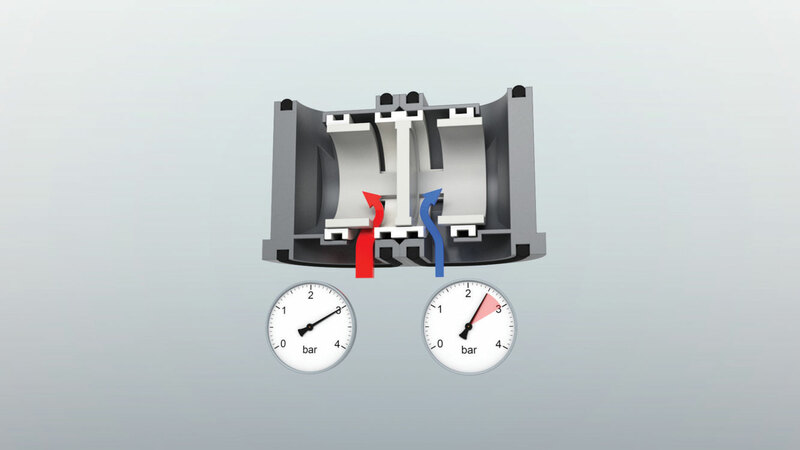 Pressure-balanc- ing mixers feature a single mechanism which controls both flow and temperature. The water circulates from the inlet to the mechanism inside narrow copper tubes. These have two benefits – standing water is minimised and water flow is accelerated. Both these factors minimise the develop- ment of biofilm, which provides shelter and a source of nutrients for bacteria. Many mixers used in public and commercial environments are cast in brass. The moulds are made from sand and although the external surfaces are plated and polished, the interiors are rough, with niches where bacteria can adhere. 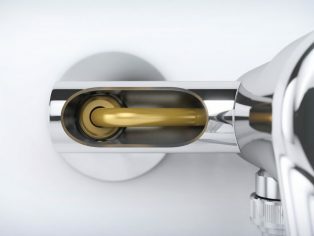 Taps with smooth interiors have fewer niches where bacteria can adhere, significantly slowing biofilm development. Moreover, as a preventative measure, cleaning mixers in a descaling solution will further reduce biofilm build-up. If those mixers can be removed easily, they can be regularly cleaned or disinfected if a contamination episode occurs. Advances in anti-scalding technology and infection control have led to a multitude of products that offer different solutions for patient, staff and visitor safety in healthcare environments. Certainly the technologies are not mutually exclusive and not always complex. It is possible to control Legionella and provide scalding safety for most situations and accommodate the comparative risk levels. Figure 1 shows a ceramic cartridge where both the cold and hot water supply pressure is 3 bar, and the outlet temperature is pre-set to 41°C. If the cold water pressure drops to 2.5 bar and the hot water pressure remains at 3 bar, the higher pressure at the hot water inlet causes the shuttle to displace, restricting the hot water flow into the mixing chamber while simultaneously allowing more cold water to flow. As a result, the mixed water at the outlet remains at 41°C (Figure 2). Similarly, if the pressure at the hot water inlet drops to 2.5 bar and the cold water pressure remains at 3 bar, the shuttle adjusts the apertures to increase the hot water and reduce cold water flow into the mixing chamber. (Figure 3).